Check out our photo gallery from the recent 3rd Annual Gala Dinner Awards 2013, presented at 8 Northumberland Avenue, London. Can you spot yourself, or a friend or a colleague? 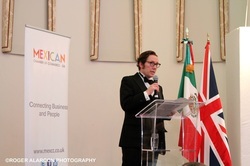 This event was hosted by the Mexican Chamber of Commerce in GB and watched by a large and enthusiastic audience representing all sectors of the industry. Congratulations to all the winners, and thanks again to all the sponsors who made the event possible! We hope an enjoyable evening was had by all. MexCC proudly supports the efforts of Misión México UK to give love, life and hope to the children in Tapachula.